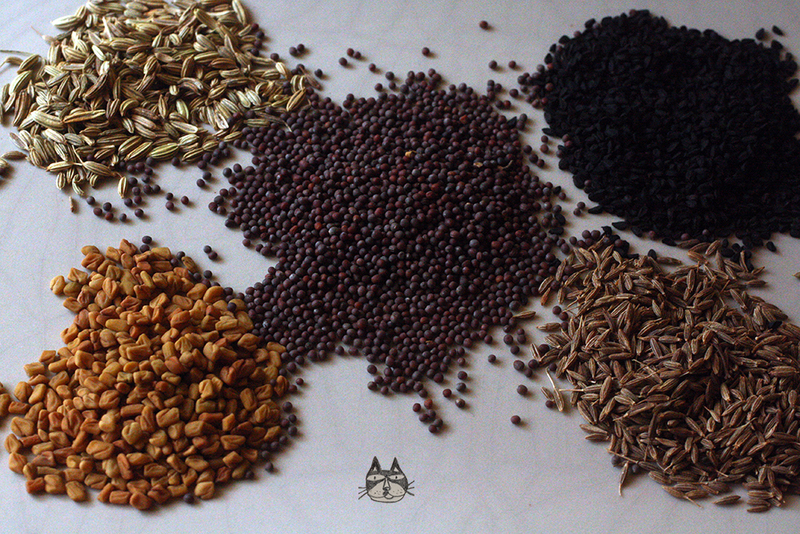 Panch Phoron means ‘5 spices’, a spice blend where the seeds are used whole. I encountered it online when I was finding out what I could do with nigella (kalonji) seeds. I find that this mix is easy, and adds a subtle spice flavour to dishes. It is easy to make – just equal parts of the 5 spices. I have used this spice mix to make mango pickle, and chicken liver curry. If you are feeling adventurous, frying a small amount in oil, and immediately sautéing vegetables like cauliflower and spinach works quite well – adds a slight spice touch to a simple dish. If you have any other recommendations, please tell me! Quite keen to know what else I can make with spice mix. Mix equal portions of each spice, and you can use it immediately: in mango pickle, or chicken liver curry.